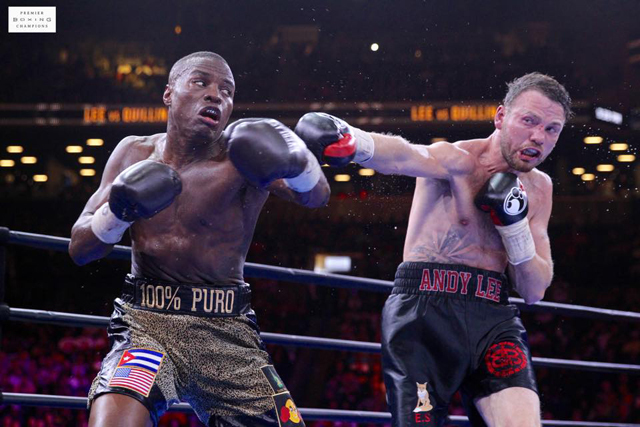 The magnificent Barclays Center, Brooklyn, New York, USA, played host to the intriguing clash between WBO middleweight champion “Irish” Andy Lee and former, undefeated holder Peter “Kid Chocolate” Quillin. There was controversy at the weigh-in, as Quillin failed to make the weight and subsequently, Lee’s WBO belt wasn’t on the line. The fight was aired as part of Premier Boxing Champions on NBC, and the bout while not fast paced, certainly contained drama. A lack of action, for periods, was countered by the intense nature of the affair. Both are noted punchers and it was the orthodox American who had early success, with a big right-hand; scoring a knock down in the first. He also followed up, at the bell, rocking the Irishman, whose knees dipped and was kept-up by the corner post. Though not ruled a knock down, as just after the bell. As Lee got back to his corner, he was met by the seemingly unflappable Adam Booth – who always remains calm and in control, in these type of situations. Also, Lee has been dropped in fights before and comeback and he would again in the contest. The second round contained some good trading, at the end of the round, but an accidental clash of heads caused Lee to be cut over the left-eye. Things certainly weren’t going his way and in the third, he was dropped by a right-hand. Though more due to Quillin’s left-foot, standing on his right. Referee Steve Willis, ruled it a knock down. I scored the fourth even, as it was uneventful, with neither man doing much. Quillin, took the fifth and by this point was miles ahead on my card. The sixth saw Lee picking his shots better and taking the round, at the end the doctor was checking his jaw. Southpaw Lee again picked his shots better in the ninth, while I gave the tenth to Peter; in a close round. It was the first time, in awhile, that the ‘home’ fighter showed some urgency. The eleventh was a clear round for the Irishman, while I also gave him the final round. The fight highlighted the vulnerabilities of both, Lee can be tagged and dropped, while Quillin is far too economical and waits too long. Some will blame the American’s struggle to make weight but he has always had a laid back approach. Lee’s heart has never been in doubt and his power remains an equaliser, he has truly shown that he belongs at the top. He doesn’t do things the easy way, but that makes him so much fun to watch. The judges scores were 113-112 Lee, 113-112 Quillin and 113-113 Draw; so a split decision Draw. If the title had been on the line, Andy Lee would have remained champion. My scorecard read, 133-113, a Draw. I never thought I’d be writing that, after the first half of the fight. Just shows, that you can never count Andy Lee out. Peter Quillin remains unbeaten at 31-0-1, 22 KOs – and may well look to move up to 168lbs. Andy Lee’s record is now 34-2-1, 24 KOs and he can move onto defending his WBO title. A rematch, is always an option and I’d certainly enjoy watching it.